The event was in the Mitchell Library, a rather intimidating and unpleasant Brutalist building that was overheated and very uncomfortable to be in. There was a good turn out; I counted about 30 people. 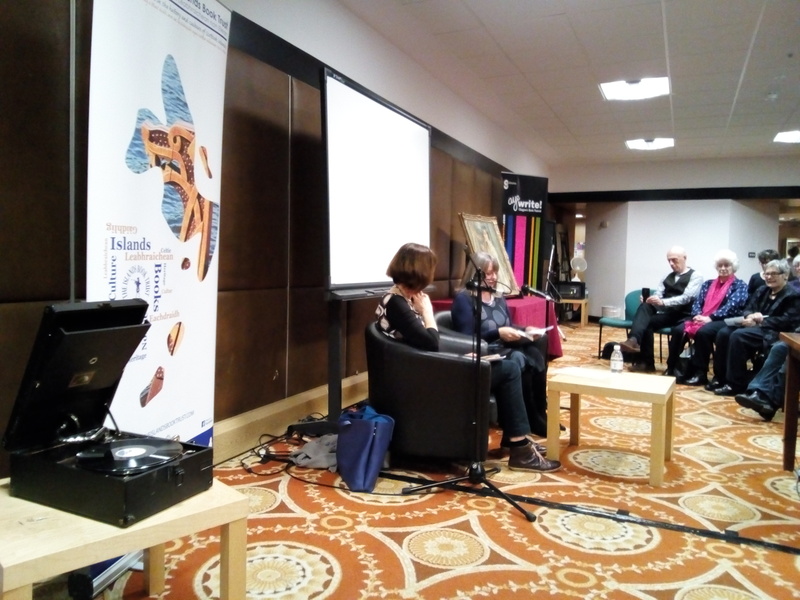 Helene sat at the front alongside Anni Donaldson, who chaired the event and asked just the right questions, not talking too much but drawing Heloise out and giving her ample space to reminisce about the family and to read extended passages from the book. I took the wind-up gramophone, and Helene brought a 78rpm record so that we could have music at the beginning and end. Helene had asked the Mitchell Library as well as Glasgow museums , if some of Heloise’s stuff which the library and museum holds, could be exhibited. 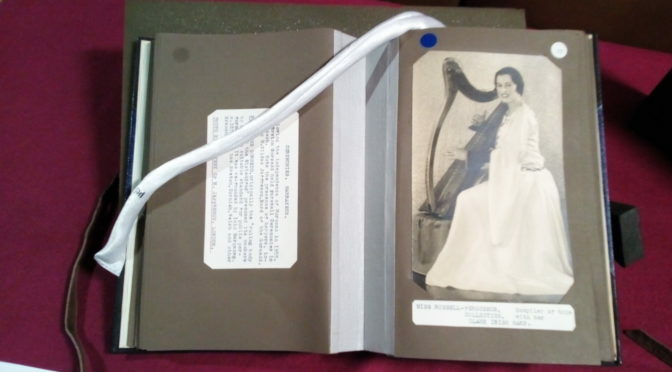 Not everything could be brought along – the most notable omission was Heloise’s Clarke Irish harp, which she called “harplet” and which she used as her main instrument for all of her harping career. But Harplet’s embroidered cover was there on display, as well as other objects like the brooch Heloise wore at the Gorsedd of Bards at Roscoff, the letter from Arnold Dolmetsch, some of her scores and the tapes she made at the end of her life, and of course some of the volumes from her amazing photo-scrapbooks that are held at the Mitchell. There was also the wonderful oil portrait of Heloise, by Cathleen Mann, which is featured on the cover of the book. 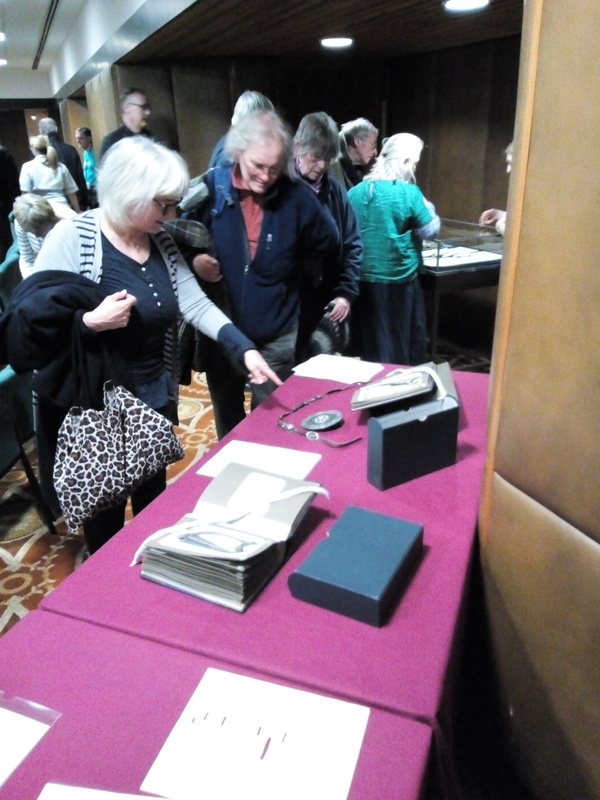 Helene had also brought some items from her family archive, including records and papers and the Dolmetsch “first clarsach”. All in all it was a wonderful event. Seeing the objects, listening to Helene’s reading and memories, hearing the sounds of the 78rpm record from the 1930s and also excerpts from the unreleased tapes made just before her death in 1970, really brought her legacy alive for me in a very moving way. And I think a lot of the attendees felt the same way.